Pimped website: HTML5, still with RDFa, restructuring and a slidebar! Myself, I upgraded the website to HTML5. It used to be XHTML, but it seems XHTML+RDFa is not really established yet; or, at least, there is no good validator. So, it's now HTML5+RDFa (validation report; currently one bug). 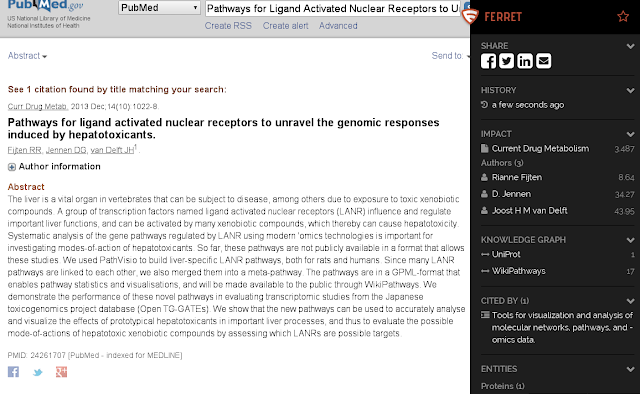 Furthermore, I updated the content and gave the first few collaborators ORCID ids, which are now linked as owl:sameAs in the RDF to the foaf:Person (RDF triples extracted from this page). 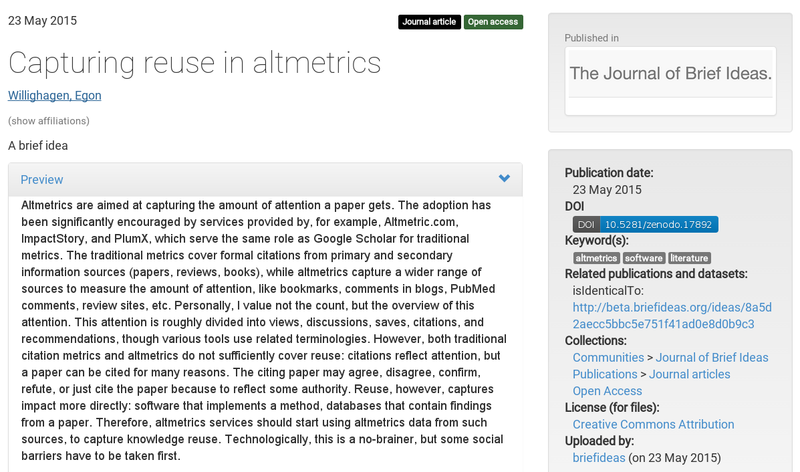 I argued earlier this year (doi:10.5281/zenodo.17892) in the Journal of Brief Ideas that measuring reuse of data and/or results in databases is a good measure of impact of that research. Who knows, it may even beat the citation count, which does not measure quality or correctness of data (e.g. you may cite a paper because you disagree with the content; I have long and still am advocating the Citation Typing Ontology). But making the link between databases and papers is not only benefiting measuring reuse, it is also just critical for doing research. Without clear links, finding answers is hard. I experience that myself frequently, and so do others, like Christopher Southan, and it puzzles me that so few people worry about this. Of course, databases do a good part of linking, but only if they expose an API (still rare, but upcoming), it is hard to use these links. 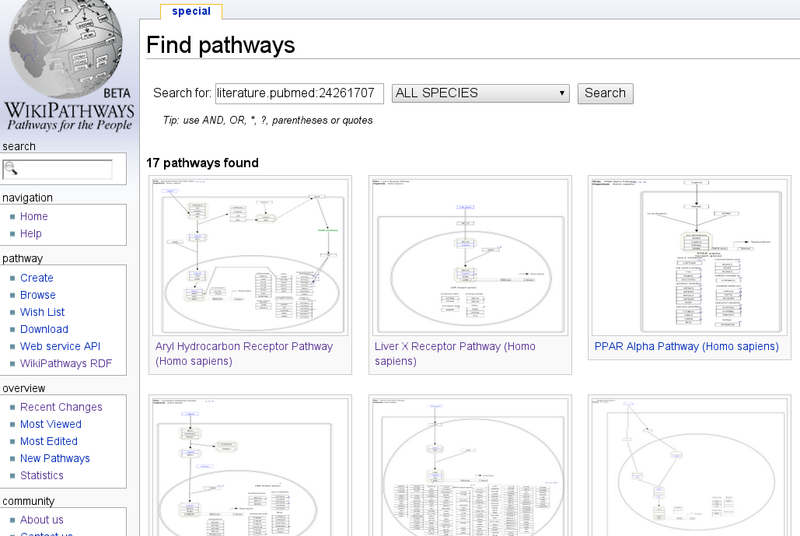 PubMed Commons can be used to link to (machine readable) version of data in a paper. See, for example, these four comments by me. 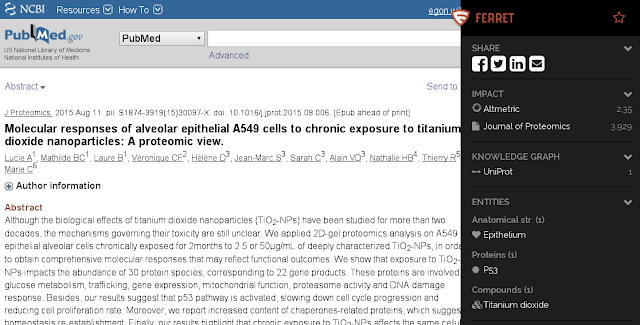 This screenshots shows the results for a nanotoxicity paper and we see it picked up "titanium oxide" (accurately picking up actual nanomaterials or nanoparticles is an unsolved text mining issue). We get some impact statistics, but if you read my blog and my brief idea about capturing reuse, I think they got "impact" wrong. Anyway, they do have a knowledge graph section, which has the paper-database links, and Ferret found this paper cited in UniProt. Thus, when I asked them if it would be hard to add new databases to that section, and I mentioned Open PHACTS and WikiPathways, they replied. 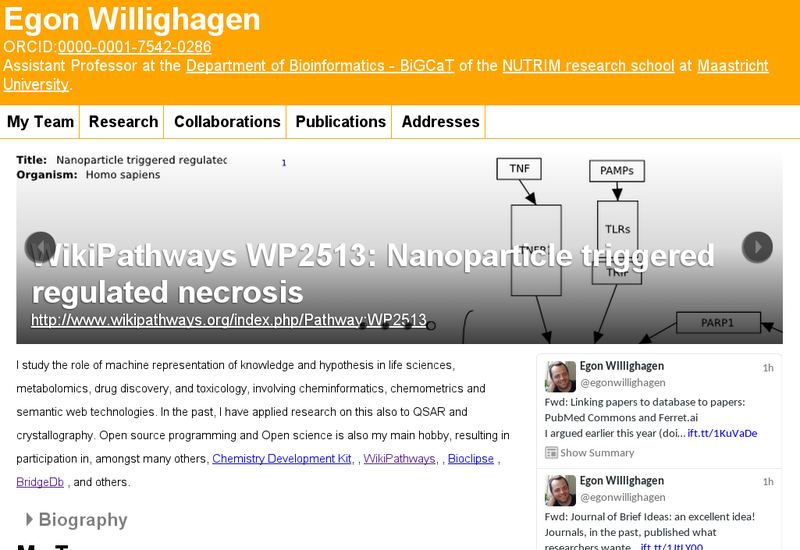 In fact, within hours they told me they found the WikiPathways SPARQL end point that Andra started, which they find easier to use than the WikiPathways webservices :) They asked me for a webpage to point users too, and while I was thinking about that, they found another WikiPathways trick I did not know about, you can browse for WP2371 OR WP2059. 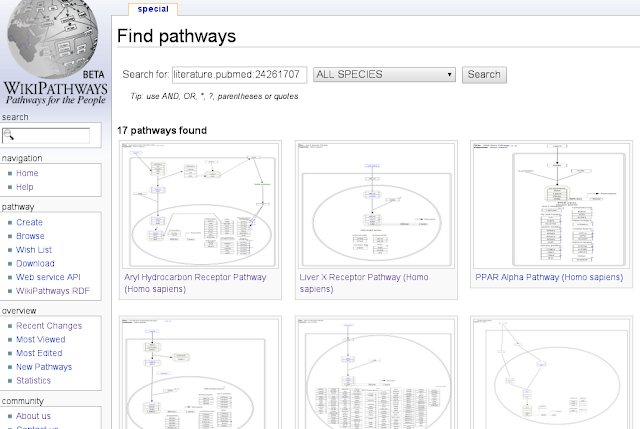 Tina then replied that, given a PubMed ID, there was even a nicer way, just browse for all pathways with a particular PubMed ID. Ferret version 0.4.2 did not work for me, but they fixed the issue within a day, and the above screenshot was made with version 0.4.3. So, besides like a bunch of good hackers, they also seem to listen to their customers. So, what databases do you feel they should add? Leave a comment here, or tweet them at @getferret (pls cc me). Fijten, R. R. R., Jennen, D. G. J., Delft, Dec. 2013. 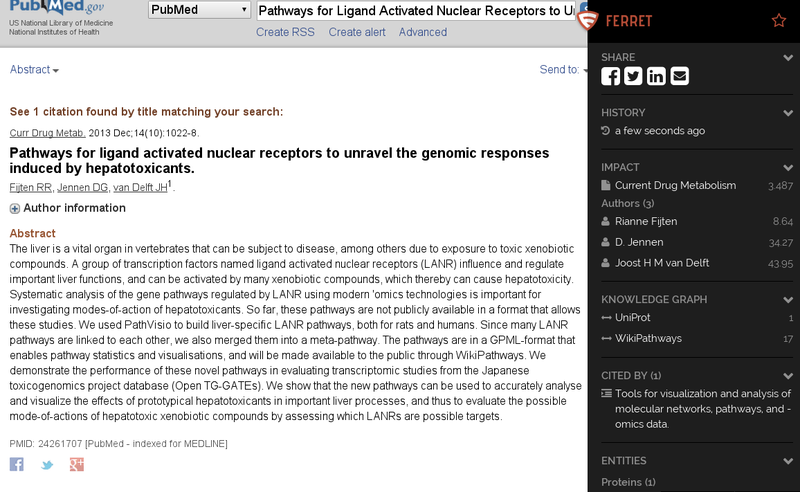 Pathways for ligand activated nuclear receptors to unravel the genomic responses induced by hepatotoxicants. Current Drug Metabolism, 1022-1028. Journal of Brief Ideas: an excellent idea! Journals, in the past, published what researchers wanted to talk about. That is what dissemination is about, of course. Like everything, over time, the process becomes more restricted and more bureaucratic. All for quality, of course. To provide and to formalize that scientific communication has diversity, many journals have different articles types. Letters to the Editor, Brief Communications, etc. Posting a brief idea, however, is for many journals not of enough interest. For my readers, please give it a try. You know you have that idea you like to get some feedback on, but you know you will not have funding for it, and it does not really match what general research plans. It would be a shame to leave that idea rot on the shelf. Get it out, get cited! I tried it too, see below my brief idea as found on ZENODO (where they automatically get deposited), and my experiences are a bit mixed. I like the idea, but it is also getting used to. The number of words are limited, and I really find it awkward not to cite prior art, the things I built on. The above points reflect a good deal of my reservations. 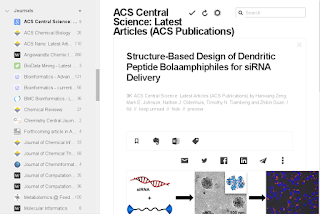 The ACS Central Science RSS feed in Feedly. Finding new or useful knowledge to solve your scientific problem, question, etc, is key to research. It also is what struck me as a university student as so badly organized (mid-nineties). In fact, technologically there was no issue, so why are scientists not using these technologies then?? This question is still relevant, and readers of this blog know this is a toy research area to me, and I have previously experimented with a lot of technologies to see how they can support research, and, well, basically, serendipity. Hence, internet-aided serendipity. Returning to the single journal TOCs. Here, RSS feeds have shown to be critical, happy to find a RSS feed for ACS Central Science (http://feeds.feedburner.com/acs/acscii). It is good to see that the journal's RSS feed for the ASAP papers contains for each paper the title, authors, the TOC image, and the DOI (possibly, it could also include the abstract and ORCIDs of the authors). Better, it should adopt CMLRSS and include InChIs, MDL molfiles, or SMILES of the chemical compounds discussed in that paper (see this ACS JCIM paper: http://dx.doi.org/10.1021/ci034244p). With proper adoption of CMLRSS, chemists could define substructures and be alerted when papers would be published containing chemicals with that substructure (and it does not have to stop there, as cheminformatically it is trivial to extend this to chemical reactions, or any other chemistry). After all, we don't want to miss the chemistry that sparks our inspiration! I personally keep track of a number of journals via RSS feeds which I aggregate in Feedly, which filled the gap after GoogleReader was closed down. Feedly does not support CMLRSS (unfortunately, but I have other tools for that) and there are a few alternatives. So, I hope the ACS Central Central journal will pick up your challenge and continue to support modern (well, CMLRSS was published in 2004) technologies to support your past workflows! 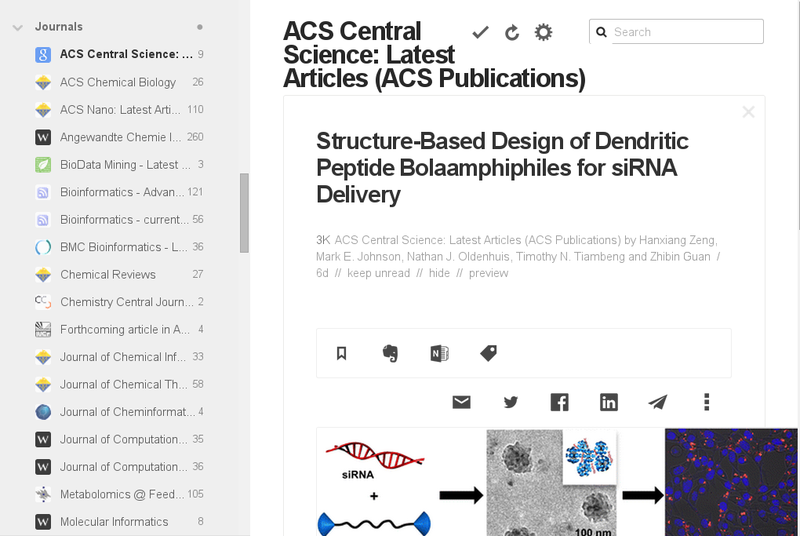 For example, make the link to the ACS Central Science RSS feed more prominent, and write an editorial about how to use it with, for example, Feedly. Or, just browse this posts in blog, where I have frequently written about the innovation with publishers (in general; some do better than others). Henry Rzepa: The chemical Web at 22 and where it might go.